When Estrella organizes a protest against the treatment of tejanos in their town of Monteseco, Texas, her whole family becomes a target of “repatriation” efforts to send Mexicans “back to Mexico” –whether they were ever Mexican citizens or not. Dumped across the border and separated from half her family, Estrella must figure out a way to survive and care for her mother and baby brother. How can she reunite with her father and grandparents and convince her country of birth that she deserves to return home? There are no easy answers in the first YA book to tackle this hidden history. In a companion novel to her critically acclaimed Shame the Stars, Guadalupe Garcia McCall tackles the hidden history of the United States and its first mass deportation event that swept up hundreds of thousands of Mexican American citizens during the Great Depression. MY TWO CENTS: The one thing not lacking in All the Stars Denied is very intense, often life-or-death, drama. Guadalupe Garcia McCall presents readers with historically accurate situations and characters and environments that many readers may connect with deeply. The story is also full of incredibly high stakes, and ultimately can be read as a coming-of-age story. All the Stars Denied is fast-paced, and readers hit the ground running with Garcia McCall’s high-stakes, dramatic writing. Estrella Del Toro’s family’s story, particularly that of her parents, is spelled out more clearly in Shame the Stars. The story takes place in the Rio Grande valley, an area of Texas where Mexican-American or Tejano (Mexican-Americans born in Texas) identity is often built into every capacity of life. As Estrella illustrates early in the story, language in an area like Monteseco is fluid, with people switching from English to Spanish easily, as their Mexican and American identities interact. Estrella organizes her protest to show the injustices shown to people born on American soil but of (sometimes very distant) Mexican descent. This not only recognizes that, though the people of her town are U.S. citizens, their ethnicity and culture bring their citizenship into question. This also demonstrates the inseparability of ethnicity and culture of many people in Latinx communities in the U.S.
Garcia McCall’s attention to these details is especially critical in today’s political and social climate. She demonstrates how intertwined the lives of many Mexicans and Mexican-Americans are, and how similar the cultures continue to be throughout the United States. Through this, Garcia McCall exemplifies the extensive presence, scrutiny, and discrimination that Mexicans and Mexican-Americans have had in the United States for many decades. Garcia McCall also addresses class issues in her book; readers take a close look at the disparities between economic and social classes through Estrella’s experience as a repatriate. The reader gets the impression that the family is quite comfortable in Monteseco and holds both economic and social prestige in their community. During the repatriation process, though, Estrella is thrust into the very real experience of those who do not have the economic means to save themselves from unfair judicial processes. She, along with her mother and younger brother, experience a disarmament of sorts, where anything they might have been able to use to help their cause is denied to them. Throughout their journey, Estrella’s mother tries to soften the blows of their newfound economic hardship, reminding Estrella that much of what they experience is the norm for populations more socially or economically disadvantaged than they are. Estrella learns to appreciate their newfound situation, humbles herself, and works with her mother in any way she can to make sure their family survives another day. The points made above all contribute to the way in which All the Stars Denied is a Bildungsroman, a coming of age story about a young girl who grows exponentially as a person because of the difficult, unjust, and discriminatory situations she experiences. Estrella repeatedly looks to her family for direction through her father’s journals, her mother’s sage advice, and her grandmother’s memory, and she uses her own journal to express her thoughts and emotions. Even still, and regardless of her young age, Estrella takes a leadership role throughout the narrative. The reader can see Estrella’s development by the way that she creates plans and ideas. Though her proposals might be half-baked, Estrella’s consistently trying to help her mother, putting herself in positions to listen and learn from others to the great benefit of her family. While Estrella’s outspokenness might arguably lead to more scrutiny upon her family, her growing courage – and her notorious tenacity – assist her family in so many different ways and helps her to become a person that not only her family can be proud of, but one that she can be proud of herself. 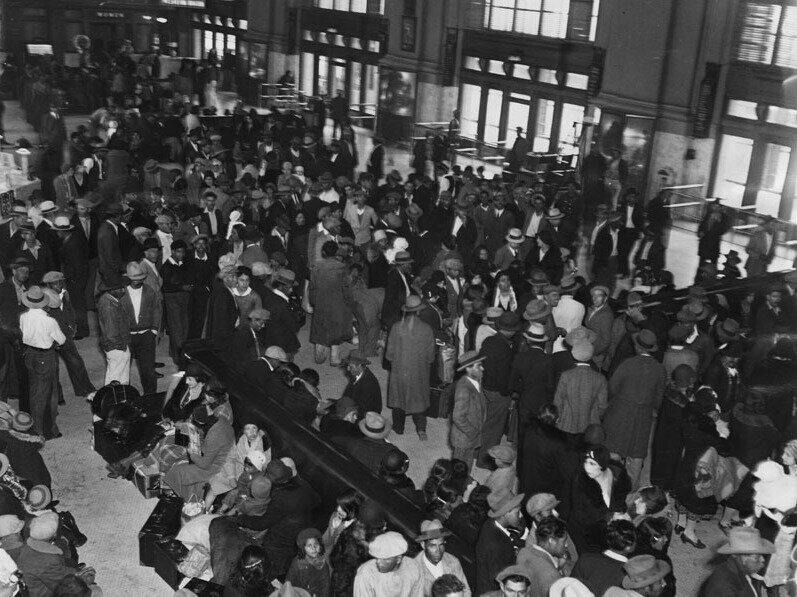 Mexican and Mexican-American families wait to board Mexico-bound trains in Los Angeles on March 8, 1932. County officials arranged these mass departures as part of “repatriation campaigns,” fueled by fears that Mexicans and Mexican-Americans were taking scarce jobs and government assistance during the Great Depression. Los Angeles Public Library/Herald Examiner Collection. Posted on NPR’s website 2015. TEACHING TIPS: In All the Stars Denied, as in Shame the Stars, Garcia McCall shows readers why Mexican American studies is an incredibly important part of any school curriculum, but especially in areas of the country where a majority of the population either comes from or is descended from Latinx countries. Both books stand on their own. By reading both novels, the reader learns about a slice of history not often taught, and is able to do so in both a macro- and microscopic way. 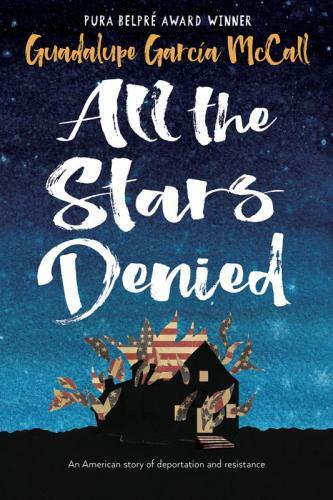 In All the Stars Denied, readers see the damage that Mexican Repatriation did to entire communities in cities across the country, as well as to individuals and their families. The life-and-death stakes were real, and this book is an excellent way to introduce not only the chaos caused by terrible discrimination in general, but specifically the destruction caused by unjust immigration laws and xenophobia. The novel can also teach about the economic hardships experienced around the country as a result of the Great Depression. Much of what Estrella’s family faces during their time in limbo is a result of their lack of monetary resources, but also the lack felt by both the U.S. and Mexico. Though not the only two teaching tips in the book, these points can easily be used to jump into more contemporary conversations, looking at ways in which present day immigration laws and current economic policies create waves of hardship experienced by many already disenfranchised communities. The resources that Garcia McCall includes in the appendices give excellent background information that is accessible and of significant interest to both youth and adult historians interested in learning about this piece of concealed history. Posted on Lee & Low Books’ website: Jacqueline Stallworth, curriculum consultant and professional developer, created a guide featuring All the Stars Denied for the “Putting Books to Work” panel at the International Literacy Association (ILA) conference. Check out this guide to find out about tips and strategies for how to use All the Stars Denied alongside other great texts in your classroom.